For the last few years, I have purchased the store version of this chili sauce until I realized that I can easily make it on my own and enjoy the health properties it possesses. Sriracha sauce has taken the country by storm. It is one of the hottest of hot sauces; and makes everything taste better. Let’s face it, the bottle just doesn’t last long enough. For the last few years, I have purchased the store version of this chili sauce until I realized that I can easily make it on my own. 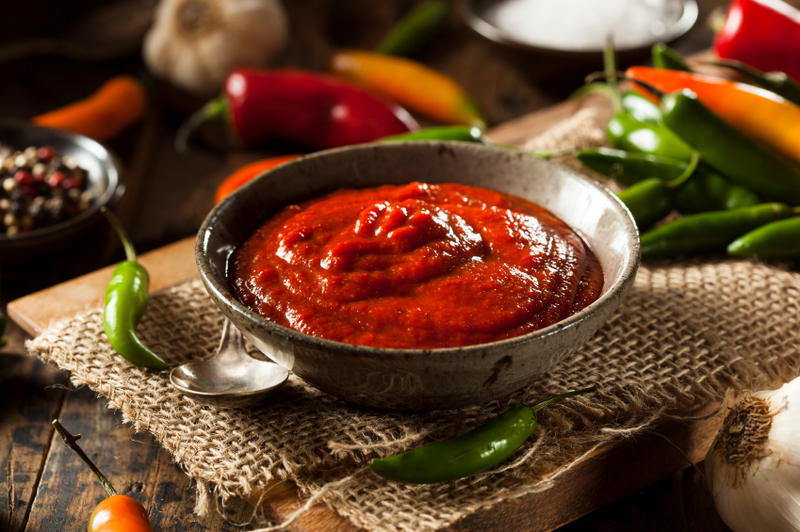 Made from jalapenos, this delicious sauce can easily be made. The ingredients in this zesty sauce boasts health benefits, as well. The fermentation process aids in digestion and provides helpful probiotics. Chilis contain capsaicin which is known to boost metabolism and potentially bolster weight loss. It also boosts endorphins and promote serotonin to produce a happier mood and better memory. Garlic is good for lowering cholesterol and blood pressure. As well, it has antibiotic properties. Fans of the “rooster sauce” say it can also aid in the body’s ability to dissolve blood clots, fight inflammation, improve circulation, and help you fight a cold by acting as an expectorant and loosens mucus. Try this cold remedy next time you are coming down with a cold: slices of ginger, squeeze of lemon juice, a squirt or two of Sriracha hot sauce, and very hot water. Place ingredients in a food processor with a steel blade and pulse until chilis are very finely chopped. Scrape sides of bowl, if necessary. Transfer mixture to a clean canning jar, cover, and allow it to sit at room temperature. Check jar each day for fermentation, when little bubbles begin to form at bottom of jar, about 3-5 days. Stir contents each day, continuing to allow fermentation until chilies are no longer rising in volume, an additional 2-3 days. Transfer chilies to jar of a blender, add in white vinegar, and puree until completely smooth, 1-3 minutes. Transfer to a mesh strainer set atop of a medium saucepan. Strain mixture into saucepan, using a rubber spatula to push through as much pulp as possible, only seeded and larger pieces of chilies should remain in strainer. Bring mixture to a boil, reduce heat, and simmer until sauce thickens and clings to a spoon, 5 or 10 minutes. Transfer to an airtight container and store in refrigerator for up to 6 months. *Note: if you want the fermentation properties to remain, skip this last step. The thickness may be different from the original version of the sauce, but the health benefits are worth it. Once you make Sriracha, you can use it as your favorite condiment and add it to your favorite recipes! Add it to your mayonnaise for a kicked up version on your sandwiches. Meat marinades – sriracha sauce is great added to marinades. I made these chicken skewers a while back and the family loved them. Soups/Stews: Sriracha is often served with pho in Vietnamese restaurants, but it goes great with just about any kind of soup or stew. Try adding it to ramen, tomato soup, or gazpacho. Mac and Cheese: Sriracha’s spicy, tangy flavor goes with almost anything that is creamy. Vegan Meats: Use sriracha with tempeh, seitan, or any other meat alternative. Or add some sriracha sauce to your favorite baked goods. Try this Sriracha pumpkin pie recipe.